Property of "Your Gay" State of IowaThis sign doesn't make a whole lot of sense to begin with. It was posted right next to a public sidewalk under Highway 61 in downtown Dubuque. 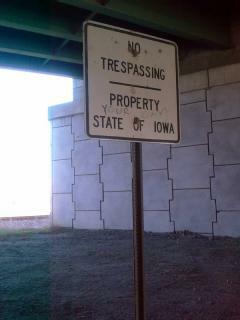 I guess it is directing people to stay on the sidewalk - perhaps it should read "Property of the State of Iowa"? I would have preferred a more genial "Please Stay on the Sidewalk". While I assume the graffiti was written in response to the recent court decision striking down Iowa's Defense of Marriage act, I can't quite figure out whether it expresses gay pride or the (irrational) belief that Iowa has somehow been made gay. If one is in the mood to deface public property (which I of course discourage), one should consider both the visibility of the location and the effectiveness of the message. It might be more effective and humorous to slap "Gay Marriage" under a Stop sign (anti-) or "to Gay Marriage" under a Yield sign (pro-). Either way, given the sign's location I don't imagine a whole lot of people even notice this obscure political statement.